Achieve your body’s full function with chiropractic care . At A to Z Chiropractic, we address your full-body health by looking at the spine. Your brain and body communicate with all systems of your body through your spinal cord. If a part of your spine is out of alignment, it can compromise your health. Dr. Zach and Dr. Ashley are extensively trained in protecting your nervous system by relieving pressure in the spine. By doing so, your body can achieve its full function, giving you the ability to maximize your well-being. Massage is a great compliment for regular chiropractic care. 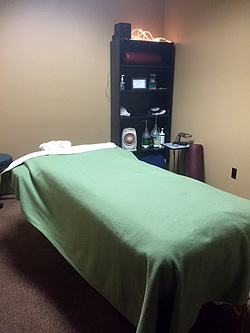 Our licensed massage therapist Abby can provide you with several different types of massage therapy. You’ll find stress relief, relaxation and improved posture and circulation are some of the many benefits you might experience. We’ll instruct you on exercises and stretches that are effective in addressing your particular problems. These customized activities help you by increasing your strength, stability, flexibility and overall wellness. We monitor your exercise plan, making sure they’re completed properly and using various tools such as foam rollers when appropriate. This form of therapy stimulates your nerves with an electric current, reaching deeply into your tissue to help a number of issues. It increases your blood circulation and can assist in managing pain. An individualized scan of your feet creates a custom orthotic inserted into your shoes to support your body’s foundation. They can be worn in a variety of different shoe styles, increasing your balance, function and motion while you move around each day. We offer our patients an adhesive, hypo-allergenic kinesiology tape that can improve sports performance and treat injuries. A wide variety of ailments can be helped by the use of this tape, which decreases inflammation and swelling, delays fatigue, distributes physical stress and normalizes muscle tone. This specialized table gives your spine massage and traction by using rollers. It may increase your range of motion and alignment, as well as restore elasticity to your ligaments. 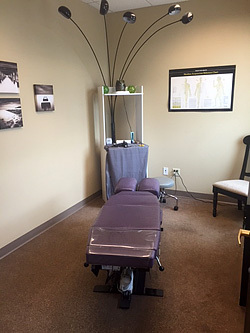 Your time on our traction table gives you a tranquil moment to release stress while helping your body to heal! Get out of pain and start on improving your quality of life. Convenient Saturday appointments are available. Contact us today!